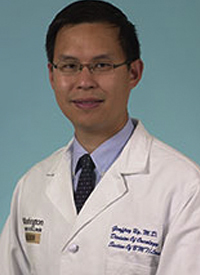 There are several FDA-approved therapies for patients with newly diagnosed acute myeloid leukemia (AML), each of which plays a specific role in the treatment landscape, said Geoffrey Uy, MD. As more targeted therapies enter the space, Uy added that greater reliance on a patient’s molecular and cytogenetic profile will direct physicians to the best available therapy. Several trials are expected to read out soon, said Uy, and one that has garnered a lot of interest is the combination of the BCL-2 inhibitor venetoclax (Venclexta) plus a hypomethylating agent or low-dose cytarabine (LDAC). In July 2018, AbbVie and Genentech, the co-developers of venetoclax, submitted a supplemental new drug application (sNDA) for the frontline combination for patients who are unable to receive intensive chemotherapy. In an interview during the 2018 OncLive® State of the Science Summit™ on Hematologic Malignancies, Uy discussed the impact of targeted therapies on the treatment of patients with newly diagnosed AML. OncLive: What are some of the big advances that have been made in AML? Uy: This is an area where there has been a lot of excitement because multiple drugs have been approved, 5 of which were approved in the last 18 months. We have also entered the era of targeted therapy with the approval of the FLT3 inhibitor midostaurin. In my presentation, I talked a little bit about some of the newer FLT3 inhibitors that are currently in clinical trials, such as quizartinib, gilteritinib, and crenolanib. I also discussed the IDH inhibitors enasidenib (Idhifa) and ivosidenib (Tibsovo), as well as the results of the single-agent data in relapsed/refractory patients. For relapsed/refractory patients and older patients who may be unfit for intensive chemotherapy, we have targeted drugs that are well tolerated. Can you elaborate on the role that each approved agent plays in the AML treatment landscape? We are looking at AML as a collection of diseases, and each of these agents has a specific role. For example, midostaurin is approved for FLT3-mutated patients. CPX-351 (Vyxeos) was primarily tested in older, secondary AML patients. We are using gemtuzumab ozogamicin (Mylotarg) with increasing frequency for patients with good-risk AML. Could you discuss advances in clinical development that are being made in this space? Several new agents that are targeting specific recurring mutations in AML are being tested in clinical trials. We should see the results of these studies in the next few years, and hopefully that will lead to more drug approvals. As we get further into these studies, it will be very important to understand the genetics of AML and the particular mutations that these patients may harbor to best select a targeted therapy for their disease. What other agents are in development for AML? FLT3 and IDH1/2 are probably the best examples and the first examples for which we have targeted therapies, but there are other agents in the pipeline. There is incredible interest in anti-apoptotic agents, particularly with the BCL-2 inhibitor venetoclax. We should see the results of trials pretty soon for these agents in the frontline setting. Also, people are looking at targeting other recurrently mutated genes in AML, including DNMT3A and p53, both of which have a big impact in this disease. Are FLT3 and IDH1/2 mutations the easiest to target? These are 3 of the most commonly mutated genes in AML. It is a very heterogeneous disease. An individual patient can have multiple mutations and various combinations. As we divide AML into smaller subgroups, it tends to be harder to validate a drug’s efficacy for a particular population through clinical trials, especially if the mutation is quite rare. What combination therapies are being explored to treat patients with AML? This is a big area of interest, particularly with the IDH inhibitors ivosidenib and enasidenib, which were tested in the relapsed/refractory setting as single agents. In many cases, these mutations can occur later on in the develop of leukemia, so they may not be in a patient’s founding clone. As a single agent, we know that these responses probably are not going to be durable. There is a lot of interest in combining these targeted agents with drugs that are known to have anti-leukemic [properties], such as traditional 7+3 and upfront induction, or the hypomethylating agents such as azacitidine and decitabine. Is it too early to comment on hedgehog inhibitors? That is a different pathway that is being targeted. There have been studies with a Pfizer hedgehog inhibitor that look promising—not as a single agent, but as a combination with either low-dose cytarabine or traditional 7+3. We really just need to see the longer-term follow-up for those studies. What studies are you anticipating? There have been single-agent phase I/II data presented with venetoclax plus low-dose cytarabine and azacitidine/decitabine that show very promising response rates. To understand the impact of these agents, you really need to see what the OS benefits may be, and that requires at least 1 or 2 years of follow-up. Stone RM, Mandrekar SJ, Sanford BL, et al. Midostaurin plus chemotherapy for acute myeloid leukemia with a FLT3 mutation. N Eng J Med. 2017;377:454-464. doi: 10.1056/NEJMoa1614359.